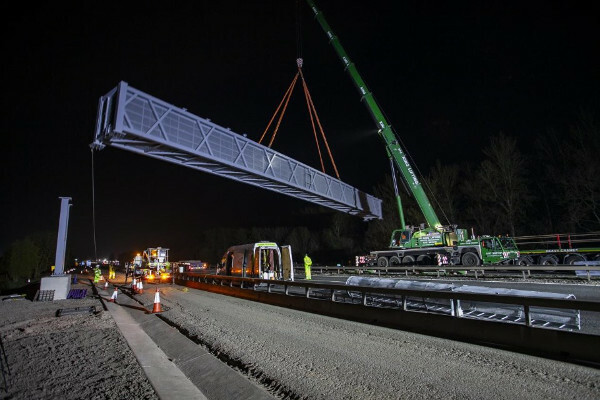 Highways England has installed a ‘superspan’ gantry 40 metres long and weighing around 46 tonnes across a stretch of the M6 as part a £234m smart motorway scheme. The gantry spans the width of the M6 and was lowered into place by a specialist crane weighing 200 tonnes near Corley Services between junctions 3 (Coventry / Nuneaton) and 4 (Coleshill). The work took place at the weekend at the end of last month. Highways England assistant project manager David Croser-Drake said: ‘We planned this work meticulously to ensure that we could get the M6 open on Sunday morning as quickly and as safely as possible. The overall project will create a smart motorway between junctions 2 and 4 – a total of 13.6 miles. It involves a mixture of all lane running stretches, where the hard shoulder is being converted into a running lane, and stretches of ‘controlled motorway’, where the hard shoulder will be retained, with a mixture of three and four-lane carriageways. The finished scheme will feature three controlled motorway lanes, 'retaining the hard shoulder from junctions 3a to 4 where the motorway will tie into the existing controlled motorway’, and a four-lane smart motorway between junctions 2 to 3a, with no hard shoulder except between junctions 3a and 3 eastbound, where an existing ‘climbing lane’ means that there are already four running lanes. There will be nine emergency areas where there is no hard shoulder. There will also be a new central reserve barrier ‘made of concrete to improve safety’, two new noise barriers, and low noise surfacing on the road.